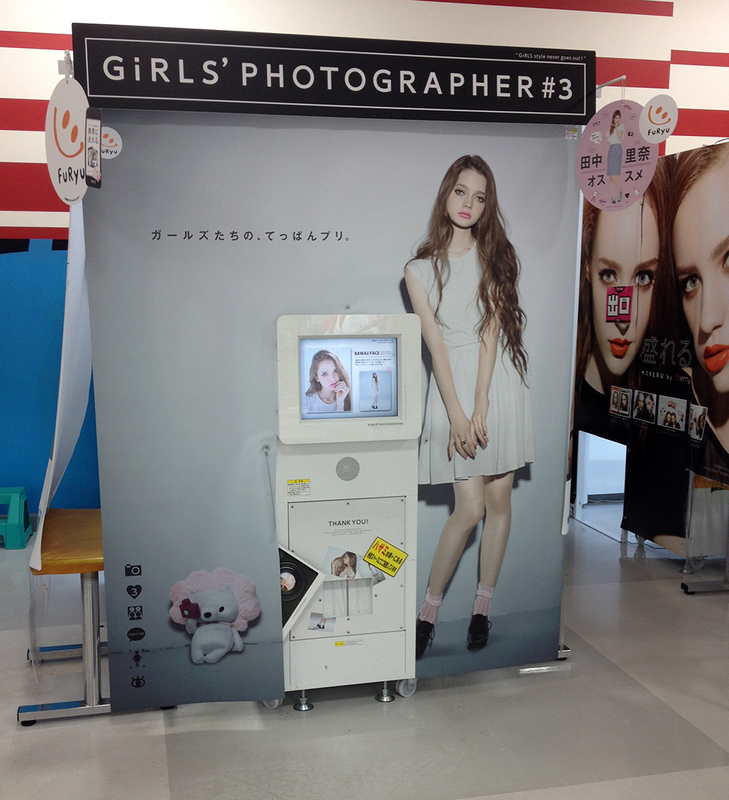 Purikura booths can almost always be found in arcades, or “game centers” in Japan. Sometimes there’s just a couple, but oftentimes you’ll find a good number of them. They’re all a little bit different, so sometimes choosing which one you’re going to use can be a bit of a chore. There are a few places which have a rack of costumes that customers can dress up in if they so desire. So how do you choose what booth to use? The best way is to choose the machine with the models that are making the most ridiculous poses. A close runner up is to make your selection based on how awesome the name is. My personal favourite has been “Foto Roooom”. Or you can simply use the booth that has the most appealing features, or colours. Basically the goal of the machine is to make you look awesome, so expect skin smoothing, and eye brightening to happy no matter what you choose. When you’ve found your booth it’s time to go inside and get started! 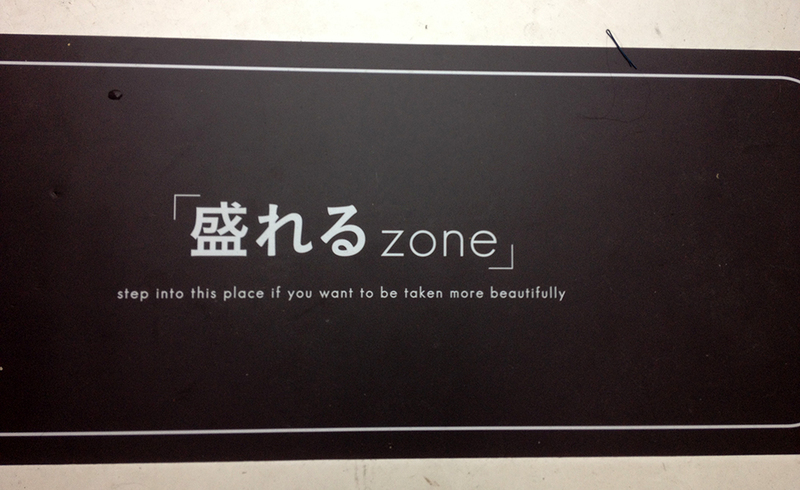 Purikuri generally costs 400 yen for two photo sheets. You cannot print extra sheets, so that’s definitely something to keep in mind. Inside there’s usually a place to put your belongings so they’re not in the way for photo time. Once you’re ready touch the screen to get started, and just follow the instructions! In some machines you choose skin colour and eye size options beforehand, and some are at the end. The selection process is all timed, so make sure you don’t take too long or the machine will choose for you! Backgrounds and borders are often chosen before you take your photos. When you’ve made it through all the screens it’s time to SMILE! If you’re stuck for what pose to strike, just copy the models on the screen. You’ll be able to see yourself on the screen, so don’t worry if you need to do that last second hair fix-up. A sign on the floor telling you where to stand in the booth. You’re photos are all taken, and you’re feeling pretty good. Now it’s time to go to the side of the booth and decorate your pictures! There are two seats in the decoration station, and it’s all done with stylus type pens. 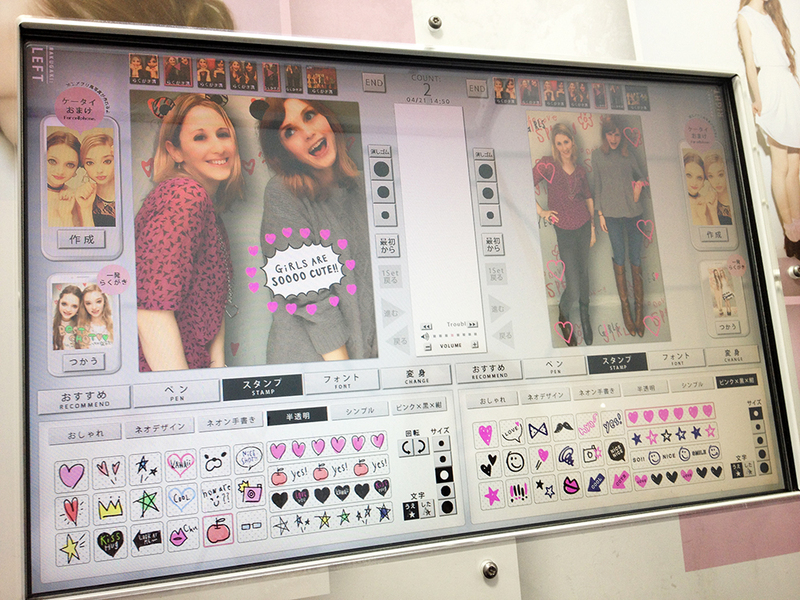 All machines have stamp decorations, and the ability to write on the picture as if you were using a pen. There are borders, date stamps, and little goodies you can use as costumes. Some of the English phrases are so wonderfully awkward that you can’t help but stick them in somewhere. 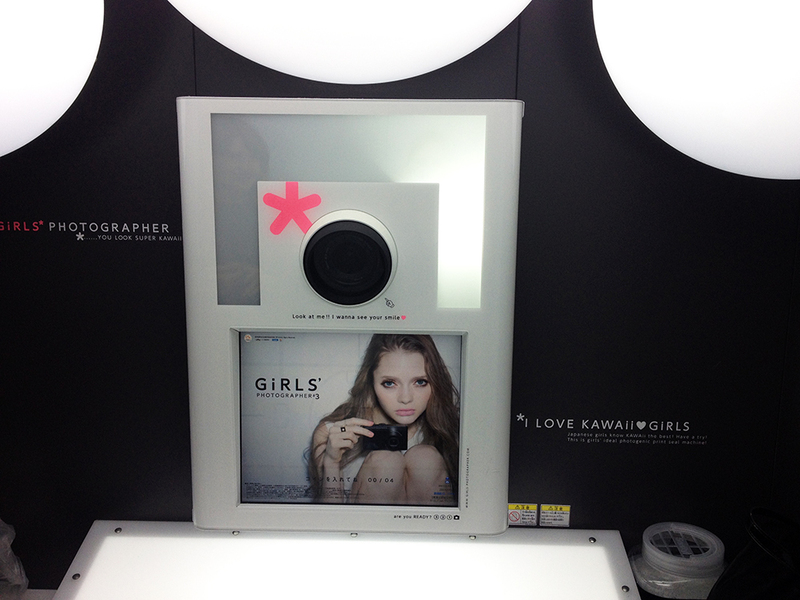 In a lot of the booths you can also add makeup to your face, change your eye colour, or tint your hair. Music plays as you go, and while there is a timer, it stops for a good amount of time if there’s no one taking photos in the booth. See some decorating in action in the video below. When you’re all finished, you choose the type of layout you want the sheets to print out as. They usually have recommendations based on the number of people. And when you’re fancying-up your photos don’t worry about your purse or bag, there’s “luggage hooks”! The decoration stations are also behind a curtain, so be as creative and silly as you want. No strangers will be hovering over your shoulder. The last step of the process is to actually get the photos. Usually you go around to the front of the booth for your final instructions. On that touch screen you’ll have the option to enter two cellphone or smartphone e-mail addresses to have one or two photos sent to free of charge. Then all you have to do is wait for your photo sheets to come out! If you’re with a group of people you may have to cut the photo sheets so that everyone can have some pictures to take home. 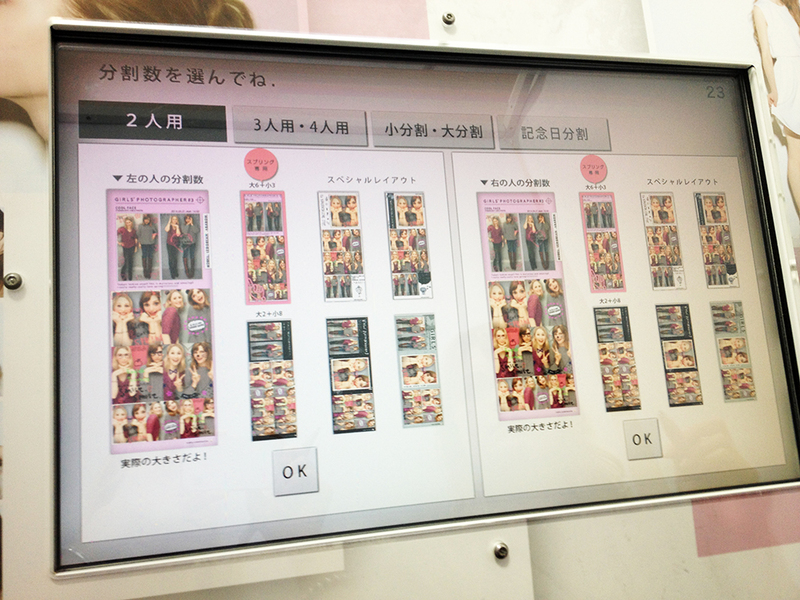 Most places with the purikura booths will have a table and scissors available for use. 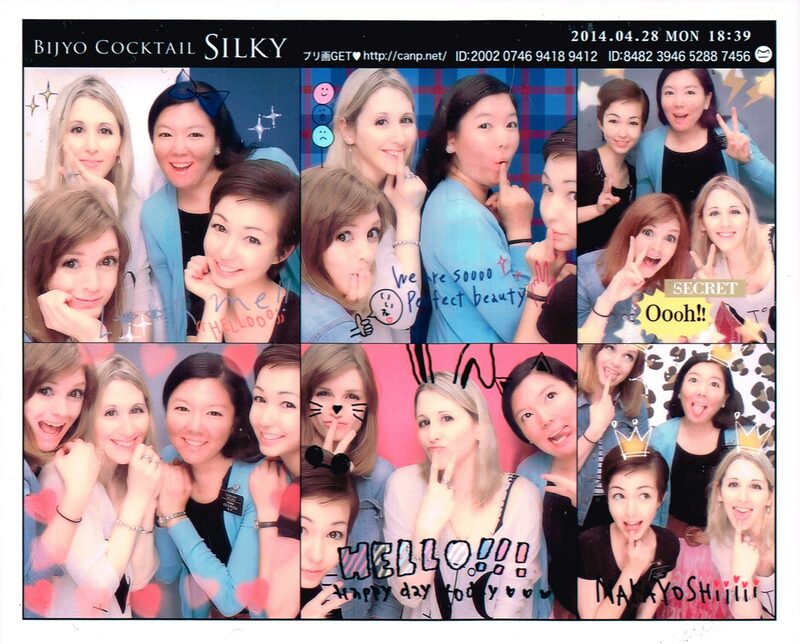 Here’s a collection of the purikura that I did at the end of April and beginning of May. Click the thumbnails to see the full set. Purikura make great keepsakes, and there are also a good number of places that have the more standard “memorial photo booth”. These ones you can’t usually decorate as much, but they’re still fun to do! 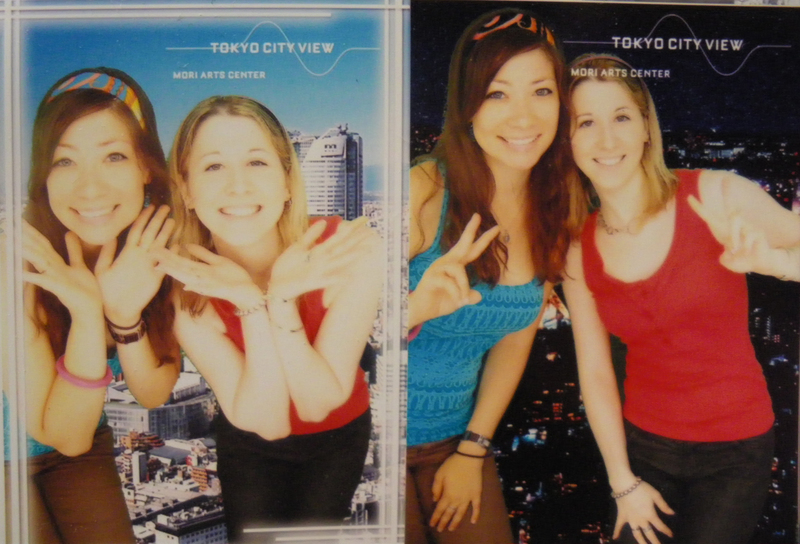 Kat and I tried it out at the Mori Arts Center in Roppongi Hills, and other places, like the planetarium, had them too. And now for a super special bonus! One machine that we used at the beginning of May was having a special extra photo that you could take. The photo didn’t print out on the sticker sheets, but it was included in the photos that were sent to whatever address that was entered. 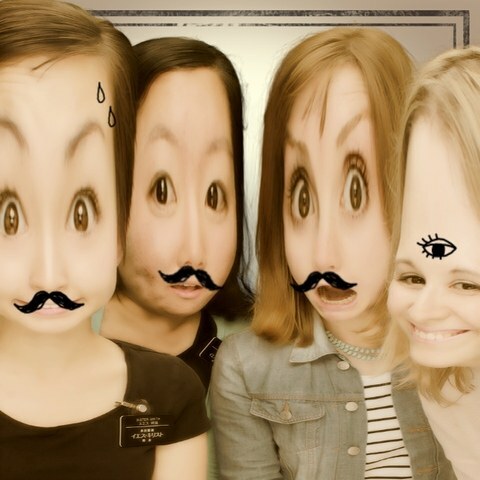 Purikura booths are a lot of fun, especially when you go with a group of friends. It’s a definite must try if you’re visiting Japan.